What Does the Church’s “Teaching Authority” Mean for Protestants? Protestants are popularly known as being skittish about talking about the Church’s “teaching authority.” Certainly Evangelicals are. There is a sense that acknowledging the Scriptures as the Word of God and affirming the doctrine of sola Scriptura–that Scripture, not the Magisterium of the Church is the final authority in establishing matters of doctrine–should cause us to turn our noses up, or at least be suspicious of claims for churchly authority. And there’s something to that. We want to be clear of a few misconceptions of the Church’s teaching authority. For one thing, we want to make sure and remember that the Church is subject to the Word, not the other way around. The Word authorizes the Church, the Church doesn’t authorize the Word. The Church responds to the Word, even recognizes it as the Word, but it does not establish it. The Church is brought into being by the Word–it is the “creature of the Word” as Luther puts it. Just as God speaks a word at creation and the world comes into being, so God speaks the word of the Gospel and the Church comes into being. All that I affirm as a Protestant. But that’s not all that we can say about the Church’s teaching authority. It’s not a matter of Magisterium or ‘What this means to me’ in your local small-group. No, many Reformed have recognized that God has given the Church in its broadest and narrower institutional expressions the task of representatively serving Holy Scripture. “First, the church is the witness and guardian of the sacred writings, and discharges, in this respect, as it were the function of a notary.” God has entrusted the Scriptures to the church for safekeeping, to guard and protect them from corruption or harm (cf. Deut 31:9; Rom. 3:2). Again, though, just because Israel was entrusted with the tablets of the covenant, that does not mean they established or authorized the covenant, but they themselves were governed and authorized as God’s people by them. “The second office of the church is, to distinguish and discern the true, sincere, and genuine scriptures from the spurious, false, and suppositious” (cf. 1 Cor. 14:37; 2 Thess. 2:1-2). The Church, again, doesn’t authorize or establish the canon, but it does recognize it. In other words, the Scriptural texts have their authority before the Church says so, but the Church is given the Spirit of God in order to recognize which texts possess that authority. As Swain says (possibly paraphrasing Whitaker), a goldsmith is trained to recognize gold, but his recognition doesn’t make the gold what it is. “The third office of the church is to publish, set forth, preach, and promulgate the scriptures; wherein it discharges the function of a herald, who ought to pronounce with a loud voice the decrees and edicts of the king, to omit nothing, and to add nothing of its own” (c. Isa. 40:9; Rom. 10:6; 2 Cor. 5:19). Whitaker’s quote is fairly clear, but the point is, the text of Scripture is supposed to be read, preached, and passed on. That does require a body of people committed to its dissemination and faithful transmission. “The fourth office of the church is to expound and interpret the scriptures; wherein its function is that of an interpreter. Here it should introduce not fictions of its own, but explain the scriptures by the scriptures” (cf. Mt. 13:52; Rom. 12:6; 1 Cor. 14:3, 29; Eph. 4:11; 2 Tim. 2:15). The Church is called to interpret the Scriptures and give their sense, not adding or subtracting, but attempting to humbly and simply explain the Word of God. This happens in all sorts of ways, but especially in the giving of preachers and teachers who take the apostolic message and explain it to the people of God, much as Ezra did the returned exiles. So then, according to Protestants, what profit is there in the Church understanding the Scriptures? Much in every way! 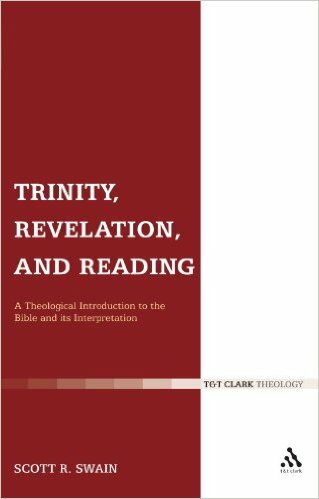 While Protestants are right to be careful of churchly overreach–claiming a magisterial authority over the Word, as if we ourselves were responsible for making the Word what it is–we rob ourselves if we fail to acknowledge the proper role God has granted his people in regard to the Word. P.S. Swain’s little book has to be one of the tightest, power-packed treatments of Scripture and hermeneutics I’ve read yet. It’s up there with John Webster’s little gem Holy Scripture. I cannot recommend it highly enough. ← Are You a Curious or a Studious Theology Student? Thanks Derek. I will be purchasing both books mentioned.